Late last year, the Bicycle Coalition of Greater Philadelphia called upon the city to increase its paving budget in our alarming Safer Streets report, which showed Philadelphia falling far behind out peer cities on issues like bike and street infrastructure. 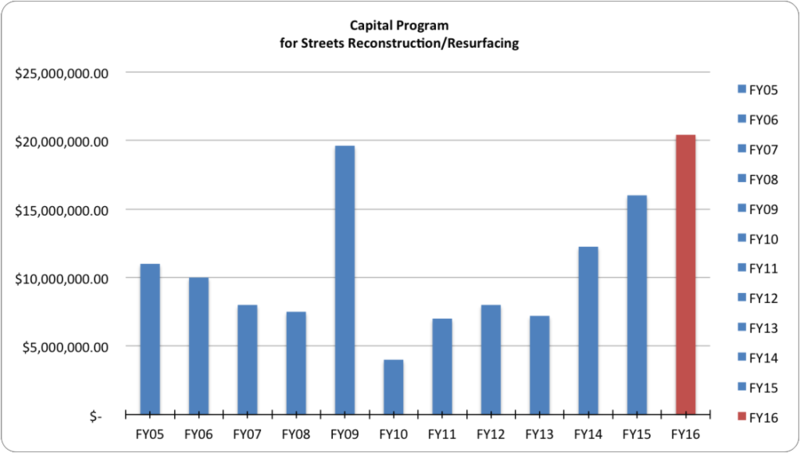 Today, we’re super glad to report that the Streets Department received some much-needed love in the Mayor Nutter’s proposed FY2016 budget. The long-beleagured paving budget received a good boost from last year, which has even garnered press attention (from us, of course, and…) by Citified and NBC10. If Council approves the Mayor’s proposal, more miles of the city’s streets will be repaved and more bike lanes will be added to the bicycle network. That is, indeed, good news. Nevertheless, it should be noted that the proposed increases are modest and won’t substantially increase the Streets-Transportation Department’s slice of the capital budget pie. 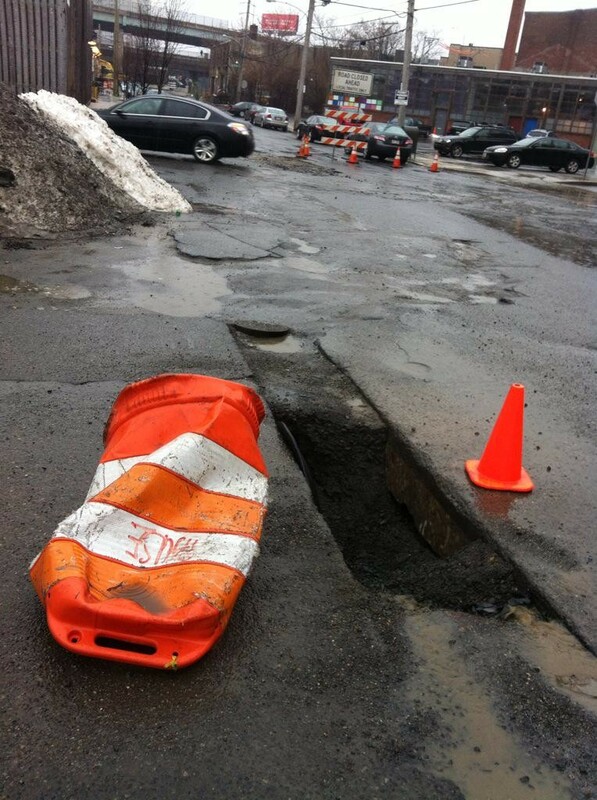 The increases are not enough to get the Streets Department out of the pothole it is currently in, which is a 900 mile backlog of streets that need repair. First, let’s look at Mayor Nutter’s proposed budget for paving in the capital program. It proposes to add nearly $5 million; bumping it up from $16 million to $20.4 million. While that increase is welcomed, the fiscal year 2016 amount proposed for paving is 11% — the same as it was FY2015 and FY2014 as a percentage of the city funds. So, while there is an increase in the actual amount from the previous two years, the level of resources devoted to paving streets remains the same as it over the past two years. During this 2015 paving season, Streets should be able to repave 60 miles with $16 million and potentially would be able to repave 77 miles in 2016 if it receives the $20.4 million. But, the Streets Department needs $34 million to be able to repave 130 miles a year, which is the repaving rate Philadelphia should be accomplishing in order to keep its streets in a good state of repair. The Streets Department Transportation projected FY16 (operating) budget is $33,118,461, which is an increase of $1.17 million from what was budgeted for FY15. That increase is helpful and greatly needed, but it keeps the Streets Department-Transportation operating budget at less than 1% of the entire $3.9 billion general fund. And, the Transportation side of the Streets Department’s budget still remains one-third of the Sanitation side of the Streets Department ($101 million). It also happens to be less than the Fleet Department ($50 million) and the Innovation and Technology Department ($46.8 million.) There’s no question that the Streets Department-Transportation Division still remains a seriously under-resourced agency. 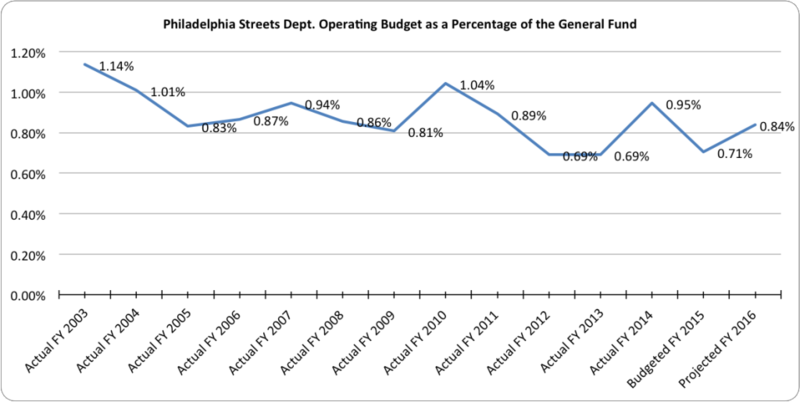 To give a sense of how under-resourced Philadelphia’s Streets-Transportation Department is, let’s compare the staffing levels to New York City. Philadelphia employs 500 persons to cover 2,575 miles of streets. New York City, on the other hand, employs 4,500 for about 6,000 miles of streets. In other words, NYC has one Streets Department-equivalent employee for every 1.3 miles of streets; while Philadelphia has one Streets Department-Transportation employee for every 5.1 miles. An under-resourced agency struggles to accomplish its core mission and has little capacity to undertake new projects. If Philadelphia is going to adopt and implement a Vision Zero policy, there remains an ongoing need to hire traffic safety engineers and transportation planners devoted to making Philadelphia’s streets safer for all road users. More than 0.84% of the general fund is going to be required to staff the Streets Department sufficiently to have a robust enough bench of professionals to design improvements to save lives, such as making intersections safer, calm traffic on high speed roads, or new innovative bicycle infrastructure, such as physically protected bike lanes.